Ha! That’s the one. Perhaps they lack the grace and mystical might that elves from the lands of fantasy may possess, but our cheerful Christmas Elves are not only a major part of ensuring that the holiday goes on without a hitch, but they’re also the only ones who’ve resided consistently in our own world! There’s something to say about giving some good time and concern to the locals, after all. Well, we’ve got some news for you if you’re the type that particularly connects with good cheer and Christmas spirit. 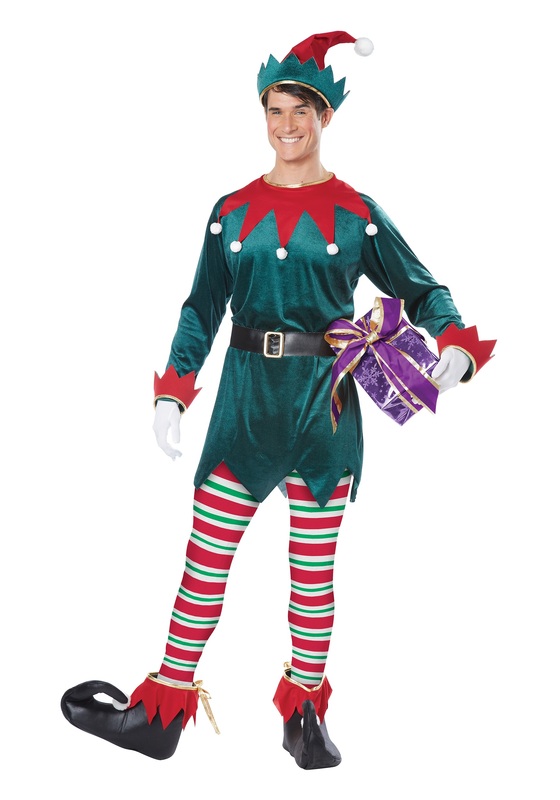 That Elfish soul might be particularly active and that is going to present you an excellent opportunity to spread that glee to the world around you with this Adult Christmas Elf costume. This velvet tunic has a jagged hemline and a bright red collar to give that zany look of workshop mirth. The striped leggings have an elastic waist for simple fit and a minty candy cane design for a glorious splash of color. Foam shoe covers keep your regular shoes looking festive all day long as well. Grab a few wrapped packages or bonus toys to go the extra mile and maybe earn a bonus from the big guy.